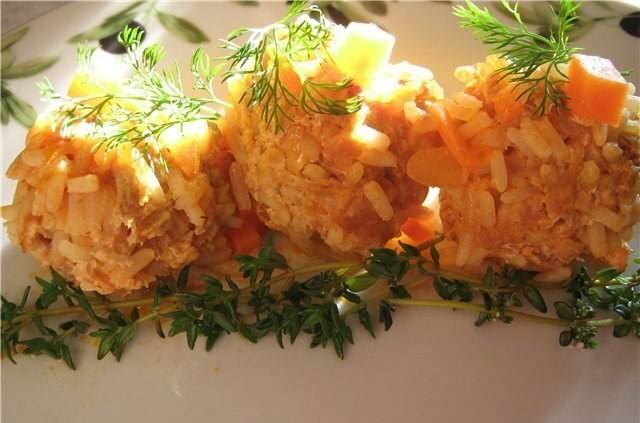 The combination of minced meat with rice has already become traditional and is called "hedgehogs". These meatballs, with grains of rice is really similar to an aggressive hedgehog, popular because of the simplicity of the recipe and its relative dimiceli. To make hedgehogs from minced meat even more useful will help them cooking in the oven. sour cream or meat broth. In order to prepare hedgehogs from minced meat, need meat. Can cook the meat yourself, or buy ready-made, but in this case, you need to remember that the minced beef quite dry, so it is desirable to further to scroll a few slices of bacon or just mix beef with pork. Since hedgehogs in the oven prepare a slightly different recipe than being stewed in water or sauce, the rice for the stuffing you must first boil for 10 minutes. During this time, the shell of the grain will soften, but will not have cooked completely, which will speed up the process of cooking meatballs from minced meat and rice in the oven. When the beef is ready, you need to mix it with rice, which is taken in a ratio of 1 to 5. If the rice is too much in the process of swelling will not hedgehogs with meat and rice porridge with minced meat. In order for the meatballs not lose shape, the stuffing can add one egg. The stuffing should be stirred to a smooth consistency, otherwise the meatballs, the rice will be distributed evenly. From the resulting meat roll balls of equal size and lay them on the oiled baking sheet. The distance between them may be minimal, since the rice is already partially sasparilla and meatballs will not change the size drastically. To cook hedgehogs in the oven takes 45 minutes to an hour, depending on the size of hedgehogs and programmes of the oven. If the liquid boils away faster than rice is prepared, it is necessary to add. Alternatively, the first half hour to cover the pan top with foil. When serving this dish additional side dish is not needed, while the substrate is made of vegetables only decorate hedgehogs. The recipe for hedgehogs can include additional ingredients in the form of herbs or spices, but the main role plays to prepare the sauce. In order to let the rice resporise to a state of readiness, it is necessary to pour on a baking sheet, meat broth or sour cream.